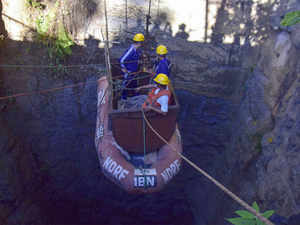 The apex court is hearing a PIL filed by Aditya N Prasad who has sought urgent steps to rescue 15 miners trapped in the illegal coal mine in Meghalaya's East Jaintia Hills district. The state government told a bench of Justices A K Sikri and S Abdul Nazeer that one crore litres of water had been pumped out from the illegal mine, but seepage from nearby rivers was creating hurdles in the rescue operation. The bench sought to know from the state's counsel as to whether any action had been taken against those indulging in illegal mining activities. Solicitor General Tushar Mehta, appearing for the Centre, told the court that every possible step has been taken for the rescue of the trapped miners and the Indian Air Force has deployed planes and helicopters for airlifting requisite equipment and manpower. The apex court is hearing a public interest litigation (PIL) filed by Aditya N Prasad, who sought urgent steps to rescue the 15 miners trapped in the illegal coal mine.